» Porterhouse Steak: What Is It Again? 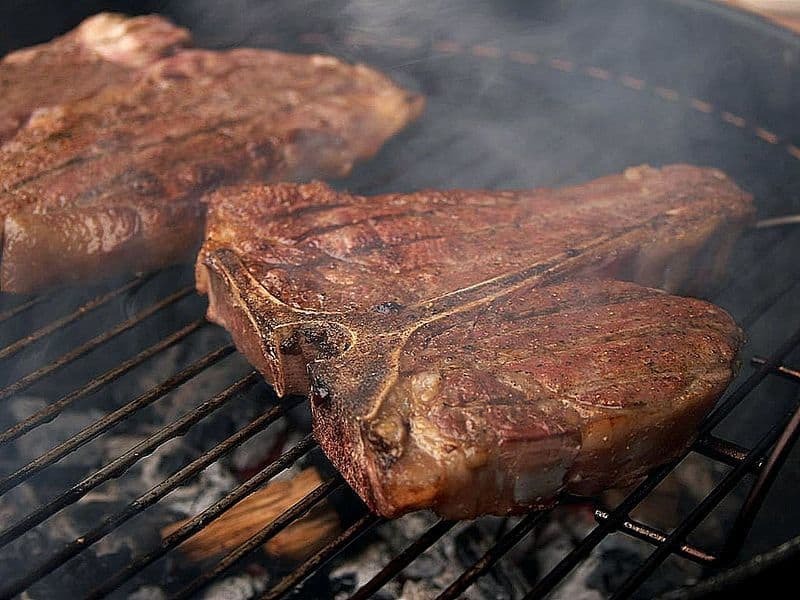 To be a Porterhouse steak, the steak has to be cut at least 1.25 inches thick, while a standard T-Bone steak only has to be at least 0.25 inches thick. If you want to see any of our specific information about Porterhouse steaks, just use the table of contents below to go straight to it in our article, or just keep reading through all of it. What kind of cuts make up a Porterhouse steak? Where Does The Porterhouse Name Come From? Is A Porterhouse Steak A Premium Steak Cut? How Does A Porterhouse Steak Compare With A Ribeye Steak? How Much Does A Porterhouse Steak Weigh? What’s The Best Way To Cook A Porterhouse Steak? What Are The Official USDA Steak Grades? The two cuts in a Porterhouse steak are: Top Loin (better known as New York Strip), and a Tenderloin cut (where Filet Mignon comes from). In the photograph below, the New York Strip part of the Porterhouse steak is the top two-thirds of the Porterhouse and the Tenderloin is in the bottom one-third of the Porterhouse. You can also clearly see the T-bone on the left side and separating the two cuts. So, with a Porterhouse, you’re getting two really high-end steaks in one (although the Tenderloin cut can sometimes be pretty small (also see above)! The origin of the Porterhouse name is a little murky. Some have claimed that it comes from where Porterhouse steaks were originally served, in public houses or bar restaurants from the 1700’s where Porter style beer, among other things, was known to be served. Or, maybe more likely, it comes from a Manhattan in the early 1800’s as referenced in the Oxford English Dictionary, where it cites that an actual “porterhouse” served big T-Bone steaks. There is no definitely proof, however, only that the cut has been around for at least a couple centuries and it is likely that alcohol of some kind was involved. Yes, a Porterhouse is one of the best cuts available. Each Porterhouse has two premium cuts in each, a New York Strip and Tenderloin, where Filet Mignon come from. Each of these two cuts are both considered premium steaks for their fat content or “marbeling”. They each come from an area of the cow that is prized for taste and tenderness. A Porterhouse has two premium cuts in each steak, neither one a Ribeye, but each is similar to a Ribeye in tenderness and to some extent, fat content, and yes, a Ribeye is also a premium cut. The Ribeye cuts come from the Rib area of the cow, while the Porterhouse comes from the Loin area. While these cuts (including each of the two in the Porterhouse) are similar in tenderness and fat content, they each have a different flavor profile. Also notable, Porterhouse steaks have to be at least 1.25 inches thick, Ribeye steaks can be cut thinner or thicker. A Porterhouse steak, as we described above, is a large cut that is basically two steaks in one and at least 1.25 inches thick. As a result, Porterhouse steaks weigh more than most other cuts, usually anywhere from 10 ounces on the very light end up to nearly 30 ounces on the largest sized Porterhouse steaks. Our favorite method for cooking Porterhouse steaks was given to use from the now famous Alton Brown. His method is clearly best for our taste and is really simple. It works for any kind of steak that you choose, although for cuts with less fat you may not want to reduce the cooking times and check done-ness. The leaner cuts generally cook faster. The Alton Brown method is also really quick, it takes more time to preheat your oven and cast iron skillet than it does to actually cook the steak. This method uses high heat in your oven and also uses a cast iron skillet heated in the oven to cook your steak in less than 10 minutes. You can see the full technique on our site here. In this post, we cook a Ribeye steak, but you can easily use the same technique for a Porterhouse steak (just make sure your cast iron skillet is big enough). When buying a Porterhouse, or any other cut of steak, try to order straight from the butcher rather than just grabbing a wrapped steak on the shelf. If you ask, the butcher can help you find a good cut from what they have available. Look for ample fat “marbeling” in premium cuts like Porterhouse, or fat mixed in with lean red meat throughout the cut. Also make sure that you don’t see any gray colored areas in the steak where you would ordinarily expect to see red meat. Also, note that when a supermarket or meat market labels a Porterhouse or any other steak as “Prime” it doesn’t usually mean the official USDA Prime grade. (See USDA grading system below). The USDA uses several different labels called “grade shields” to judge the quality of a specific cow measured by the Ribeye cut. The USDA quality grades are: Prime (Highest, given to less than 3% of all steaks), followed by Choice, and then Select. Below Select, followed by Standard and Commercial (both of which are commonly sold in retail stores). Lower still are Cutter, Utility and Canner grades. These last grades are reserved for frozen foods and other processed meats. Each of these grades is determined by a lot of different factors including the age of the cow, the fat content and other measurements (detailed methodology for these measurements can be found here). A Porterhouse steak, like other premium cuts, has a high fat content. A one ounce serving of Porterhouse steak has 4 grams of fat and 5.8 grams of protein and has 60 calories (59% from fat). Note though that because Porterhouse steaks contain two cuts in one steak, separated by a giant T-bone, you should also look at each of the two separately. The New York Strip portion of the Porterhouse in the same one ounce serving is much leaner, only 1.3 grams of fat and 8.3 grams pf protein and has 49 calories, 25% from fat. The Tenderloin portion (with Filet Mignon chosen as the cut to measure) has 5.7 grams each of fat and protein in a one ounce portion and have 68% of their calories from fat. A Porterhouse steak is a big cut, a perfect steak for two people or for one hungry steak eater. With two steaks in one, a New York Strip and a Tenderloin, you have the option of splitting it up into two based on preference each sharing parts of each of the two cuts if you’re sharing it. The New York Strip and the Tenderloin are each considered premium steaks given their location on the cow, their fat contents and other factors. The USDA Prime or Select grade for Porterhouse steaks are most likely found in a steakhouse than a grocery store, so keep that it mind if you’re shopping for the very bet cuts. Otherwise enjoy your Porterhouse at home by using our recommended “Alton Brown Steak” cooking method, you won’t regret it!